Vince Keenan: Miscellaneous: Happy Birthday, Edith Head! 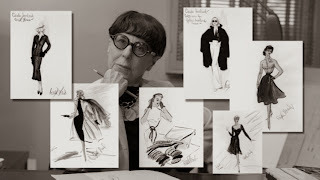 – then you already know that Edith Head was born 116 years ago. And if you’re a regular reader, you already know why Hollywood’s best-known costume designer is so significant here at Chez K. Rosemarie and I have assembled quite the bounty of material on Edie’s life and work, including her original design notes for the character played by actress Pat Crowley in the Martin & Lewis film Hollywood or Bust. Faded fabric swatches are still attached to the pages. The gorgeous doodle by Sophie Diao spotlighting half a dozen Edith costumes (among them Kim Novak’s iconic suit from Vertigo) is generating plenty of interest in Edith’s work. Turner Classic Movies is running a day-long salute that focuses on her late-career films at Universal. Already this morning I’ve been at a Google hangout featuring Ms. Diao and Susan Claassen, who performs a one-woman show about Edith. Edith’s greatest costume was the one she created for herself, the public persona of “Edith Head” that afforded her visibility and career longevity. What better way to celebrate her trailblazing legacy than by seeing her in action? Here she is with Groucho Marx on an episode of You Bet Your Life. So raise a glass to Edith Head, a one of a kind personality who in no way was off the rack. Maybe something with Fernet Branca; as Edith herself said, it’s “guaranteed to save your life on the day you want to kill yourself.” Happy birthday, Edith!